Thousands of anti-austerity campaigners are expected to pulse through the streets of Dublin on Saturday in protest against the Irish government’s controversial water charges. They warn the charges are an “ideologically-driven tax” that must be abolished. The water tax forms part of the Irish government’s wider debt re-payment plan in the wake of a crippling bank bailout that cost Irish taxpayers over €64 billion. Thousands are expected to gather in central Dublin to voice their opposition to what they say is double taxation imposed on a nation strangulated by debt. Three separate marches, highlighting the impact of austerity, are planned for Saturday afternoon. Protesters will set out from Dublin’s Connolly Station, Merrion Square and Heuston Station and convene in a mass gathering at 1pm on the capital’s O’Connell Street. 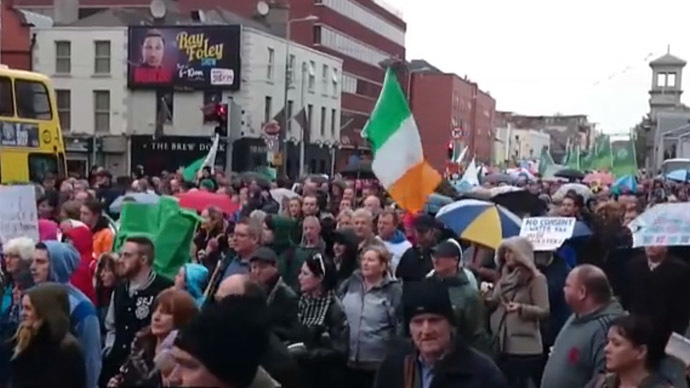 The national demonstration has been organized by Right2Water Ireland, a nationwide collective of activists, community groups, political parties, and trade unionists. The campaign argues the provision of adequately treated water and sanitation is a vital public service, and a fundamental human right recognized by the United Nations (UN). It is calling for the Irish government to legislate accordingly, and abolish its plans to enforce water charges on Irish citizens. He said the Irish government is unwilling to publicly acknowledge growing opposition to the water charges, but is "terrified" behind closed doors. “They thought they had gotten away with socializing €65bn of private debt, with a vicious five year austerity agenda.For five years those events caused nothing less than a national collective trauma. But now the Irish people have had enough and the government know it,”he added. As part of its water taxation policy, the Irish government set up semi-state firm Irish Water in July 2013. The company is responsible for developing Ireland’s water infrastructure and billing citizens for water usage. Against a backdrop of widespread poverty and a tidal wave of repossession orders surging through Irish courts, the firm has launched a €650,000 advertising campaign to inform Irish citizens on its services.The company has long been the subject of criticism, and has been marred by multiple controversies since its founding. Approximately 1.5 million households are expected to receive their first bills under the water charges scheme in April 2015. The move has proved hugely unpopular, and has been described by campaigners as the most contentious austerity measure imposed on Irish citizens since Ireland’s 2008 economic crash. It has also spawned a vibrant mass movement in its wake. Anti-water charges activists say the movement is the largest “anti-plutocratic” wave of protest in modern Irish history. The Right2Water campaign has launched an official petition calling on the Irish government to scrap its proposed water charges, and respect its citizens' human right to access water. The Irish government, however, says it will not alter or renege upon its water charges policy. It maintains the water charges will facilitate the creation of much needed funds for the development of the state's water infrastructure. Ogle was critical of Ireland’s mainstream media, warning it bolsters the interests of a neoliberal elite. “Ireland’s mainstream media cheerlead the light touch regulation that wrecked our economy,” he said.